New topic - for miscellaneous fleet discussion, sightings that don't belong in other topics. To start things off: there might be a new Dart arrival at Woden Depot this week. Possibly 140, but can't rule out a Tuggeranong unit being sent to storage. ...but can't rule out a Tuggeranong unit being sent to storage. If so, it isn't 148 or 151. Both were in service this morning. When I went past Woden depot yesterday, I didn't see 986...is it just hiding amongst the darts, Mk1s and PR3s? Or is it elsewhere? And do the buses that are recently withdrawn (provided they originally did) still have bike racks (995, 991, 992...they did last time I checked but...I couldn't tell from Athllon Dr)? If so, why? 554 has lost its Nigel Stokes decals. Back to one, 560. When I went past Woden depot yesterday, I didn't see 986...is it just hiding amongst the darts, Mk1s and PR3s (sic)? Yes - it is hiding. But only in the sense that you can't spot it from Athllon. Rest assured, it is still there. One of the Belco field vans too has a new livery covering windows too this time. Like 539s livery just without the euro 6 stuff...and on a Toyota hiace. ..
(A) There is only one "Belco field van". (B) It's a new Hiace with a new livery. (C) Don't know whether it's a paint job or vinyl wrap (or combination). Based on ACT RTA records, there are two more new Hiaces. One of these will probably be allocated to City. Both have been at Belconnen Depot the past few days. The Woden one appears to have been replaced by the old Belco one too. The iMax was still in the City this evening. 986 was at Belconnen Depot today undergoing an inspection and some maintenance. Tuggeranong Depot has had some movements as well. The PR3s are now against the screen and 3 out of 5 darts are in the shed (the other two on the bricks). A MKI PR2 (without window ads) was in the sheds today too. Without more information, the Tuggeranong moves suggests they are trying to increase their capacity. A MKI PR2 (without window ads) was in the sheds today too. If you mean a PR100.2, there's not many to choose from: 865 is the only one that fits that description. A sighting in service would help. This also raises the possibility that 856 & 126 are also in regular service, rather than being full time trainers. I've noticed over the past couple of months that the white strips either side of the front windscreen on a number of the Scania artics have been removed. 520 is one that comes to mind. They've been gone for quite a while. It's 511, 515, 520, 527 and 528 which are like this. No sign of changes at Woden Depot. 864 & 865 still in retirement, so that Mk1 bus sighted at Tuggeranong would have to be 856. 856 back next to 126. The second Hiace has been seen in service at City Bus Station. With 569 & 570 entering service this week, the number of Scanias in the fleet has reached 145. Unless there have been further withdrawals, the number of active Renaults (PR100.2 & PR100.3) is ... 145. Shortly, Renault's status as dominant bus will end. Tuggers now seems to have its new Hiace van too. Yeah, I noticed that yesterday. Could ACTION be planning on eventually converting all of them to that or is this some sort of trial? Could ACTION be planning on eventually converting all of them to that or is this some sort of trial? That's why it has a number! But when in a platoon of buses you can't always see it! I'm confused, KOB - you're saying in the platoon, you can see "Blue Rapid", but not the route number? Isn't the route number still on the nearside, which would put it closer to you than the text? I haven't seen this 'new' desto yet, but I can't imagine it's on the offside. This is what 570 looks like. Even still, it can be hard to see the numbers around other buses, peoples heads, street infrastructure, trees, etc. But how can you see "Blue Rapid" and not the number? That is your issue above, right? What? 570 has lost its "Renault Styled Desto?" I can't understand why any of the destos on the Pr2 and 3s and green buses can't just display the actual place they are servicing on one line instead of: WODEN, on an orange bus and: WODEN, via, blah street, BlaH crescent, Blach, circuit, then finally, DUFFY. IF DUFFY IS THE MOST IMPORTANT PART OF THE DESTO, WHY CAN'T IT BE DISPLAYED ON THE FRONT WITH JUST ONE LINE AND NOTHING ELSE? You can't always read the desto around obstructions and other buses in front of it!!! Not all bus stops have the right angle to see them!!! And yes. 570 has lost that program. 485 has now got it. That was all I was reporting originally! But what if you AREN'T travelling to Duffy. Or Fraser. Or whatever. Then showing a single location is not useful. The normal Hanover destos are fine. As in, Static top line final destination (Fraser West) and scrolling bottom line (Via Woden, City, Belconnen, Kippax, Macgregor). Which confirms the Scania delivery schedule has been brought forward by six months. But based on 587 being the last in service, there are 28 Scanias to come in the current contract, plus 490 - that makes only 29. Is it likely that they will keep the current livery for future deliveries of will they eventually get all the new buses in TC livery? If there is a TC livery, it wouldn't look anything like the one on the Darts - the preference will be for a livery that only requires one paint colour per panel where possible. The different colours and gradient effect on the wraps would be too painful to replicate in a paint job. I was going to say the same. Also, I don't imagine they'd change anything during the current contract. Is it likely that they will keep the current livery for future deliveries or will they eventually get all the new buses in TC livery? @normallycomplex Stay tuned for new Transport Canberra bus livery. Certainly no change yet (up to 609). Hmmmmm, recall stating the end of the ACTION name was on its way! Another new livery? geez, would've thought they'd get rid of all the 90's buses first or waited another 20 years before doing that. I personally like the current livery. Who here would actually be keen to see a new livery- especially one in the sort of colours they are using for everything Transport Canberra at the moment? I'd like a new livery although with the same colours as now (green, orange and white). 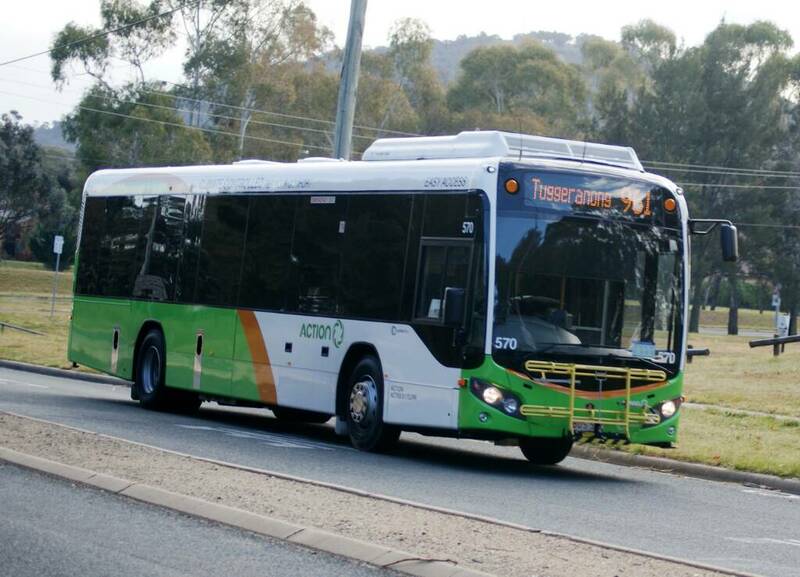 The Transport Canberra livery looks nice on the darts but I wonder what it would look like on the full size buses. I note that the ACTION (logo) icon doesn't appear to be in use anymore on Transport Canberra publications or on the City Loop livery. On the topic of the City Loop, 151 was laying over at the discussed University Avenue stop today so I guess it's now being used. ACTION logo is on the near side just in front of the fleet number on the loop livery. No. The word "ACTION" in the 2008 ACTION font is there, but the circular 6 segment logo is not. If you look at Airlines in the last few years who have changed their liveries, a lot have gone with a plainer more livery to save money (and presumably weight) whereas most bus companies prefer a single colour all over as it is easier to carry out repairs. The word "ACTION" in the 2008 ACTION font is there, but the circular 6 segment logo is not. Good pick-up. You may notice that the, um, wheel logo has been removed from the Twitter and Facebook accounts as well - but not from newly delivered buses. But they have brought back the old nxtbus ad recently that had been taken off with the arrival of TC on the on-board screens with the ACTION circular wheel logo. 975s engine sounds to be in a terrible state.